"Indic languages" redirects here. It is not to be confused with Languages of India. The Indo-Aryan or Indic languages, are a major language family of the Indian subcontinent. They constitute a branch of the Indo-Iranian languages, itself a branch of the Indo-European language family. In the early 21st century, Indo-Aryan languages were spoken by more than 800 million people, primarily in India, Bangladesh, Nepal, Pakistan and Sri Lanka. Moreover, there are large immigrant and/or expatriate Indo-Aryan speaking communities in Northwestern Europe, Western Asia, North America and Australia. There are about 219 known Indo-Aryan languages. The largest in terms of speakers are Hindustani (Hindi-Urdu, about 329 million), Bengali (242 million), Punjabi (about 100 million) and other languages, with a 2005 estimate placing the total number of native speakers at nearly 900 million. Proto-Indo-Aryan, or sometimes Proto-Indic, is the reconstructed proto-language of the Indo-Aryan languages. It is intended to reconstruct the language of the pre-Vedic Indo-Aryans. Proto-Indo-Aryan is meant to be the predecessor of Old Indo-Aryan (1500–300 BCE) which is directly attested as Vedic and Mitanni-Aryan. Despite the great archaicity of Vedic, however, the other Indo-Aryan languages preserve a small number of archaic features lost in Vedic. The earliest evidence of the group is from Mitanni Indo-Aryan. The only evidence of it is a few proper names and specialized loanwords. Rigvedic Indo-Aryan has been used in the ancient preserved religious hymns of the Rigveda, the earliest Vedic literature. From the Rigvedic language, "Sanskrit" (literally "put together", meaning perfected or elaborated) developed as the prestige language of culture, science and religion, as well as the court, theatre, etc. Sanskrit is, by convention, referred to by modern scholars as 'Classical Sanskrit' in contradistinction to the so-called 'Rigvedic Sanskrit', which is largely intelligible to Sanskrit speakers. Outside the learned sphere of Sanskrit, vernacular dialects (Prakrits) continued to evolve. The oldest attested Prakrits are the Buddhist and Jain canonical languages Pali and Ardhamagadhi Prakrit, respectively. By medieval times, the Prakrits had diversified into various Middle Indo-Aryan languages. Apabhraṃśa is the conventional cover term for transitional dialects connecting late Middle Indo-Aryan with early Modern Indo-Aryan, spanning roughly the 6th to 13th centuries. Some of these dialects showed considerable literary production; the Śravakacāra of Devasena (dated to the 930s) is now considered to be the first Hindi book. The next major milestone occurred with the Muslim conquests in the Indian subcontinent in the 13th–16th centuries. Under the flourishing Turco-Mongol Mughal Empire, Persian became very influential as the language of prestige of the Islamic courts due to adoptation of the foreign language by the Mughal emperors. However, Persian was soon displaced by Hindustani. This Indo-Aryan language is a combination with Persian, Arabic, and Turkic elements in its vocabulary, with the grammar of the local dialects. The two largest languages that formed from Apabhraṃśa were Bengali and Hindustani; others include Assamese , Sindhi, Gujarati, Odia, Marathi, and Punjabi. The Indo-Aryan languages of North India and Pakistan form a dialect continuum. What is called "Hindi" in India is frequently Standard Hindi, the Sanskritized version of the colloquial Hindustani spoken in the Delhi area since the Mughals. However, the term Hindi is also used for most of the central Indic dialects from Bihar to Rajasthan. The spoken New Indo-Aryan dialects from Assam in the east to the borders of Afghanistan in the west form a linguistic continuum across the plains of North India, Pakistan and Bangladesh. 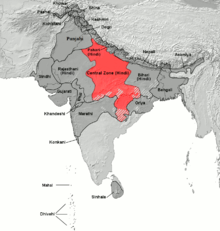 In the Central Zone Hindi-speaking areas, for a long time the prestige dialect was Braj Bhasha, but this was replaced in the 19th century by the Khariboli-based Hindustani. Hindustani was strongly influenced by Sanskrit and Persian, with these influences leading to the emergence of Modern Standard Hindi and Modern Standard Urdu as registers of the Hindustani language. This state of affairs continued until the division of the British Indian Empire in 1947, when Hindi became the official language in India and Urdu became official in Pakistan. Despite the different script the fundamental grammar remains identical, the difference is more sociolinguistic than purely linguistic. Today it is widely understood/spoken as a second or third language throughout South Asia and one of the most widely known languages in the world in terms of number of speakers. Another text has babru (babhru, brown), parita (palita, grey), and pinkara (pingala, red). Their chief festival was the celebration of the solstice (vishuva) which was common in most cultures in the ancient world. The Mitanni warriors were called marya, the term for warrior in Sanskrit as well; note mišta-nnu (= miẓḍha, ≈ Sanskrit mīḍha) "payment (for catching a fugitive)" (M. Mayrhofer, Etymologisches Wörterbuch des Altindoarischen, Heidelberg, 1986–2000; Vol. II:358). Sanskritic interpretations of Mitanni royal names render Artashumara (artaššumara) as Ṛtasmara "who thinks of Ṛta" (Mayrhofer II 780), Biridashva (biridašṷa, biriiašṷa) as Prītāśva "Whose Horse is Dear" (Mayrhofer II 182), Priyamazda (priiamazda) as Priyamedha "whose wisdom is dear" (Mayrhofer II 189, II378), Citrarata as Citraratha "Whose Chariot is Shining" (Mayrhofer I 553), Indaruda/Endaruta as Indrota "helped by Indra" (Mayrhofer I 134), Shativaza (šattiṷaza) as Sātivāja "Winning the Race Price" (Mayrhofer II 540, 696), Šubandhu as Subandhu "Having Good Relatives" (a name in Palestine, Mayrhofer II 209, 735), Tushratta (tṷišeratta, tušratta, etc.) as *tṷaiašaratha, Vedic Tvastar "Whose Chariot is Vehement" (Mayrhofer, Etym. Wb., I 686, I 736). Domari is an Indo-Aryan language spoken by older Dom people scattered across the MENA. The language is reported to be spoken as far north as Azerbaijan and as far south as central Sudan, in Turkey, Iran, Afghanistan, Pakistan, India, Iraq, Palestine, Israel, Jordan, Egypt, Sudan, Libya, Tunisia, Algeria, Morocco, Syria and Lebanon. Based on the systematicity of sound changes, we know with a fair degree of certainty that the names Domari and Romani derive from the Indo-Aryan word ḍom. The Romani language is usually included in the Western Indo-Aryan languages. Romani—spoken mainly in various parts of Europe—is conservative in maintaining almost intact the Middle Indo-Aryan present-tense person concord markers, and in maintaining consonantal endings for nominal case—both features that have been eroded in most other modern languages of Central India. It shares an innovative pattern of past-tense person concord with the languages of the Northwest, such as Kashmiri and Shina. This is believed to be further proof that Romani originated in the Central region, then migrated to the Northwest. Linguistic evaluation carried out in the nineteenth century by Pott (1845) and Miklosich (1882–1888) showed that the Romani language is to be classed as a New Indo-Aryan language (NIA), not Middle Indo-Aryan (MIA), establishing that the ancestors of the Romani could not have left India significantly earlier than AD 1000. It is argued that loss of the neuter gender did not occur until the transition to NIA. Most of the neuter nouns became masculine while a few feminine, like the neuter अग्नि (agni) in the Prakrit became the feminine आग (āg) in Hindi and jag in Romani. The parallels in grammatical gender evolution between Romani and other NIA languages have been cited as evidence that the forerunner of Romani remained on the Indian subcontinent until a later period, perhaps even as late as the tenth century. These languages derive from Magadhan Apabhraṃśa Prakrit. The following are consonant systems of major and representative New Indo-Aryan languages, as presented in Masica (1991:106–107), though here they are in IPA. Parentheses indicate those consonants found only in loanwords: square brackets indicate those with "very low functional load". The arrangement is roughly geographical. ^ The Indo-Aryan numerals are found in the treatise on horse training composed by Kikkulis of Mitanni (Section 6.9). They are aikawartanna ( Skt ekavartana) 'one turn of the course', terawartanna ( Skt tre-vartana) 'three turns of the course', sattawartanna ( Skt sapta-vartana) 'seven turns of the course', nawartana with haplology for nawawartana ( Skt nava-vartana) 'nine turns of the course'. The forms of numerals in these words are clearly Indo-Aryan. The form aika- is especially confirmatory. The form satta for Skt sapta- is a clearly Middle Indo-Aryan form. The following linguistic features reveal that the language belongs to an early Middle Indo-Aryan stage or to a transitional stage between Old Indo-Aryan and Middle Indo-Aryan. (i) Dissimilar plosives have been assimilated, for example, sapta satta. Gray quotes the MIA form for comparison, but he is silent about the fact that the borrowing in Anatolian is from MIA (1950: 309). (ii) Semi-vowels and liquids were not assimilated in conjuncts with plosives, semi-vowels or liquids as in 1st MIA, for example, vartana wartana, rathya aratiya-, virya Birya-, Vrdhamva Bardamva. (iii) Nasals were also not assimilated to plosives/nasals, unlike in 1st MIA and like in OIA. This characteristic places the language of these documents earlier than 1st MIA, for example, rukma urukmannu, rtanma artamna. (iv) Anaptyxis was quite frequent, for example, Indra Indara smara mumara. (v) v b initially, for example, virya birya, vrdhasva bardamva. (vi) r ar, for example, rta arta, vrdh bard-. Thus, a linguistic study of the borrowed Indo-Aryan forms in the Anatolian records shows that they are definitely Indo-Aryan and not Iranian nor Indo- Iranian. This also shows that this language belongs to a transitional stage between OIA and MIA. Further, this language is comparable to the language of the Indus seals as deciphered by S. R. Rao. This language is the base for Buddhist Hybrid Sanskrit, which was wrongly named Hybrid because of a misconception that it was a mixed language. Thus, the language of Middle Indo-Aryan is much before the Afokan Prakrit. On the basis of the borrowed words in Anatolian records and the language of the Indus seals as deciphered by S. R. Rao the date of MIA may go beyond 2000 BC. The transitional stage between OIA and MIA might have started in 2500 BC. Bryant, Edwin (2001). THE INDO-ARYAN CONTROVERSY Evidence and inference in Indian history. 2 Park Square, Milton Park, Abingdon, Oxon: Routledge. pp. 181–234. ISBN 978-0-203-64188-0. ^ There is good evidence that in the Old Indic or Indo-Aryan dialect to which the names belong, at the time of the documents, initial v, represented by b, was pronounced like v, while medial v kept its value of semivowel and was pronounced like w. For instance, Birasena(-Virasena), Birya (=Virya). Biryasura (=Viryasura)... 'It seems that in the language to which the names belong, just as in Middle Indic, the group pt had become tt, as in, for instance, Wasasatta(=Vasasapta), Sattawadza(=Saptavaja) and sausatti (=sausapti 'the son of susapti') Dumont, P.E. (October 1947). "Indo-Aryan Names from Mitanni, Nuzi, and Syrian Documents". Journal of the American Oriental Society. 67 (4): 251–253. doi:10.2307/596061. JSTOR 596061. ^ "Overview of Indo-Aryan languages". Encyclopædia Britannica. Retrieved 8 July 2018. ^ "Indo-Aryan Branch - About World Languages". aboutworldlanguages.com. ^ Edwin Francis Bryant; Laurie L. Patton (2005). The Indo-Aryan Controversy: Evidence and Inference in Indian History. Routledge. pp. 246–247. ISBN 978-0-7007-1463-6. ^ a b Parpola, Asko (2015). The Roots of Hinduism: The Early Aryans and The Indus Civilization. Oxford University Press. ^ "Romani (subgroup)". SIL International. n.d. Retrieved 15 September 2013. ^ Hammarström, Harald; Forkel, Robert; Haspelmath, Martin, eds. (2017). "Chinali–Lahul Lohar". Glottolog 3.0. Jena, Germany: Max Planck Institute for the Science of Human History. ^ Masica 1991, pp. 23–27. ^ "Numbers in Punjabi". www.omniglot.com. Retrieved 2018-12-09. John Beames, A comparative grammar of the modern Aryan languages of India: to wit, Hindi, Panjabi, Sindhi, Gujarati, Marathi, Oriya, and Bangali. Londinii: Trübner, 1872–1879. 3 vols. Misra, Satya Swarup. (1991–1993). The Old-Indo-Aryan, a historical & comparative grammar (Vols. 1–2). Varanasi: Ashutosh Prakashan Sansthan.